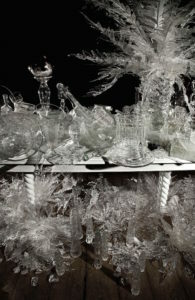 Excess and history come together in Beth Lipman’s astonishing glass work. Lipman harks back to the tradition of Still Life through the lens of contemporary consumption, creating scenes that mark the detritus of everyday life. Mundane items from food to books are immortalized in crystal clear glass, revealing the lasting influence of the objects with which we surround ourselves and ultimately acting as artifacts of the society within which we live.